On Nov. 26, 2017, Jesse Lee Hubble, 36, ignited a fire in the bed of a pickup truck in the driveway of 404 Pecan Street in Arroyo Grande. The fire quickly spread, engulfing the truck, a nearby utility trailer and ultimately the house at the address. When fire personnel arrived, the occupant of the home was trying unsuccessfully to extinguish the blaze with a water hose. A family pet was seriously injured in the fire. Hubble also ignited a separate fire in a green waste container at a home at 439 Pecan Street. The total amount of property damage caused by the arson was estimated to be more than $500,000. 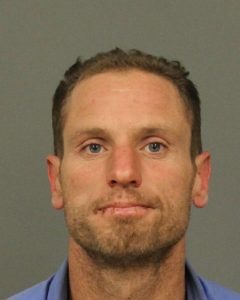 Following a week-long trial in October, a San Luis Obispo jury found Hubble guilty of arson of an inhabited structure and arson of personal property. Additionally, the jury found that Hubble had a prior conviction for first-degree residential burglary in 2016 and that he had served a prison term for felony identity theft the same year. Both of the prior offenses occurred in SLO County. The first-degree residential burglary conviction counts as a violent felony under California’s Three Strikes Law. On Monday, Judge Craig van Rooyen sentenced Hubble to the maximum possible punishment, 24 years and 8 months behind bars. “When Jimmo went to return to his vehicle, Getschel struck him with his truck, causing Jimmo’s body to be dragged out in front of his own jeep. Getschel and his associates then drove off. 24 years for lighting a truck on fire compared to 8 years for killing a man in front of his fiancee then fleeing the scene! How does this make any sense whatsoever? I hope Arroyo Grande vandal, Patty Welsh, gets the same sentence.